American Beach Volleyball Gold Medalist Celebrate, originally uploaded by BSR-12. The AVP and the United States have invited Brazil to Westgate City Center in Glendale, Arizona for the AVP World Challenge – USA vs. Brazil. If Brazil accepts, it will put the top AVP Crocs Tour players against the top Brazilian players. fc everton vs mls, originally uploaded by chasekyle. 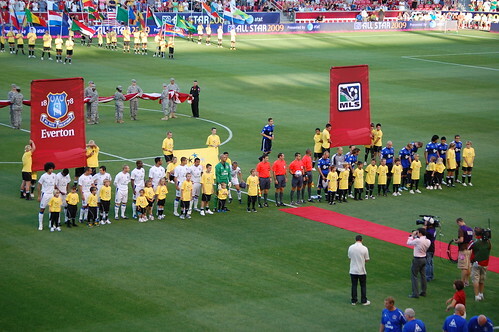 The MLS All-Star First XI and Everton FC of the English Premier League decided the game in the penalty kick session after 90 minutes and a 1-1 draw. Everton becomes the first international club to win the MLS All-Star Game on three spectacular saves by Tim Howard. In a 3-2 match (22-25, 25-23, 25-22, 23-25, 15-12) Brazil beat Serbia in the 2009 FIVB World League finals. Serbia won their fourth silver medal while Brazil wins its eighth World League title. Brazilian libero Sérgio Dutra Santos gets the MVP title of the finals along with the $30,000 USD prize. 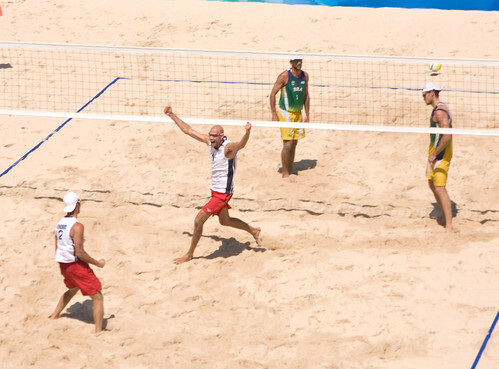 Team USA Mens Volleyball, the Defending champions, lost its second straight match in Pool E today. This loss puts USA out of the running for a medal in the 2009 FIVB World League and makes them the first victim of the Final Round in Belgrade. The Olympic champions were dominated by the Russians in straight sets. Russia will be in the semifinals.